A great crowd of Wabash alumni and their spouses, the biggest yet in the history of the Chicago Holiday Luncheon, gathered at the historic Maggianos restaurant in downtown Chicago to welcome President Pat White and Chris White to the windy city. Greg Jania ‘93, president of the Wabash Club of Chicago, welcomed the assembled crowd and served as the event’s emcee. Pat White spoke after the luncheon, telling the group about his experiences during his first semester on campus. Pat relayed a couple of classic encounters with our guys - including one while the freshmen were guarding campus during Monon Bell weekend. 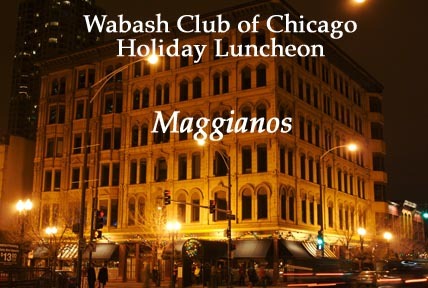 Pat also noted the Wabash Club in Chicago counts over 700 members and has a powerful network throughout the region. Pat mentioned that 16 new freshmen call Wabash their college partly because of the tremendous working relationships between area alumni and the admissions office. Pat also complimented the group on its efforts to help Wabash graduates find employment, noting one of the first jobs for a Wabash senior came from the Chicago area. Many thanks go to Greg Jania ’93 for helping organize the event, Steve Hoffman ‘85, for coordinating the event, greeting people at registration and working with Maggianos staff, and to Josh Owen ’07 for the soon-to-be posted photographs. Josh was in Chicago attending a conference and we were lucky to have him present when the original photographer became ill.